Fayette County Commissioner Dan Dean signs a proclamation in honor of the 70th anniversary of Fayette Soil & Water Conservation District. Front Row: commissioner Dan Dean, supervisor Fred Melvin; Back Row: Natural Resource Specialist Brigitte Hisey, commissioner Tony Anderson, supervisors Richard Davidson, Gary Reiterman, Jim Garland, director Chet Murphy, district technician Malcolm Miller, commissioner Jack DeWeese, and supervisor Kyle Montgomery. The Fayette Soil & Water Conservation District (FSWCD) celebrated its 70th anniversary on Feb. 10. FSWCD was formed under the provisions of the Ohio Soil Conservation District Enabling Act, passed by the 94th Ohio General Assembly on May 16, 1941. A petition was filed with the Ohio Soil Conservation Committee by Fayette County landowners on Feb. 14, 1946. During the referendum held on June 4, 1946, 93.78 percent of votes cast were in favor of the creation of the soil conservation district, far exceeding the minimum of 65 percent. Fayette Soil Conservation District was chartered by the Ohio Secretary of State on Feb. 10, 1947. The district’s name was changed to Fayette Soil & Water Conservation District on Feb. 11, 1964. From its inception, FSWCD has been governed by a locally-elected district board of supervisors consisting of five members, not necessarily farmers or landowners. Supervisors are elected to a three-year term. No supervisor receives compensation for services. The current supervisors are Richard Davidson, Jim Garland, Fred Melvin, Kyle Montgomery and Gary Reiterman. FSWCD teaches and promotes wise stewardship practices to ensure that current and future generations in Fayette County can have productive soil and clean water. FSWCD is a political subdivision of the State of Ohio, but is not a regulatory agency. The district operates on a voluntary, cooperative basis with any Fayette County citizen seeking to address natural resource concerns. The district primarily provides engineering and educational services either directly or through partnerships to individuals, schools, local governments, state and federal agencies. Some partners include U.S. Department of Agriculture, Ohio Department of Agriculture, Ohio Environmental Protection Agency, Fayette County Board of Commissioners, Fayette County Health Department, Fayette County Building Department, City of Washington Court House, RPHF Solid Waste District, Tri-County Triangle Trail, and Master Gardeners. FSWCD provides a wide range of programs either directly or in partnership with other organizations. These programs include: design and cost share of soil and water best management practices, farmland preservation, repair and/or replacement of Household Sewage Treatment Systems (septic systems), scrap tire amnesty collections, state and local Envirothons, tree and native plant sales, nature programs/field trips for children/adults/families, and many more. If you have a natural resource concern or would like to learn more about Fayette Soil & Water Conservation District, call us at 740-636-0279 or visit our website at www.fayette-swcd.com. 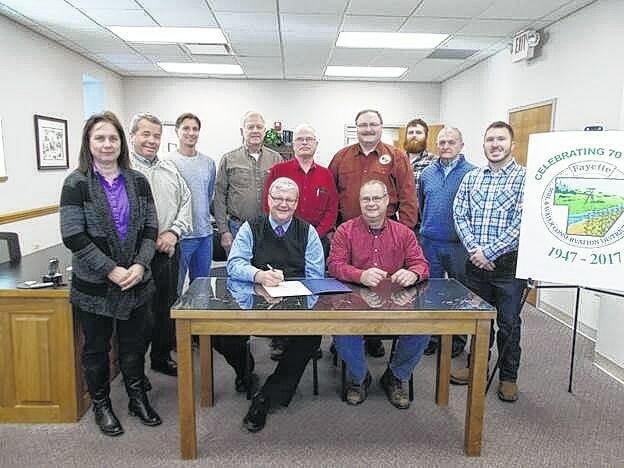 https://www.recordherald.com/wp-content/uploads/sites/27/2017/02/web1_Proclamation.jpgFayette County Commissioner Dan Dean signs a proclamation in honor of the 70th anniversary of Fayette Soil & Water Conservation District. Front Row: commissioner Dan Dean, supervisor Fred Melvin; Back Row: Natural Resource Specialist Brigitte Hisey, commissioner Tony Anderson, supervisors Richard Davidson, Gary Reiterman, Jim Garland, director Chet Murphy, district technician Malcolm Miller, commissioner Jack DeWeese, and supervisor Kyle Montgomery.